Tip: Regardless of your net worth, it’s critical to understand your choices when developing an estate strategy. Federal estate taxes have been a source of funding for the federal government almost since the U.S. was founded. Fast Fact: Estate Income. Between 2016 and 2025, the estate tax will generate about $246 billion. Until 1916. The 16th Amendment to the Constitution was ratified in 1913 — the one that gives Congress the right to “lay and collect taxes on incomes, from whatever source derived.” The Revenue Act of 1916 established an estate tax, and in one way or another, it’s been part of U.S. history since then. In 2010, the estate tax expired — briefly. But in December 2010, Congress passed the Tax Relief Act of 2010 and the new law retroactively imposed tax legislation on all estates settled in 2010. In 2012, the American Tax Relief Act made the estate tax a permanent part of the tax code. As part of the 2017 Tax Cuts and Jobs Act, estate tax rules were again adjusted. The estate tax exemption was raised to $11.2 million, a doubling of the $5.6 million that previously existed. Married couples may be able to pass as much as $22.4 million to their heirs. The 2017 Act is set to expire in 2025, so it’s possible the estate tax law may be adjusted at least once during the next few years. If you’re uncertain about your estate strategy, it may be a good time to review the approach you currently have in place. Estate taxes typically account for less than one percent of total federal revenue. 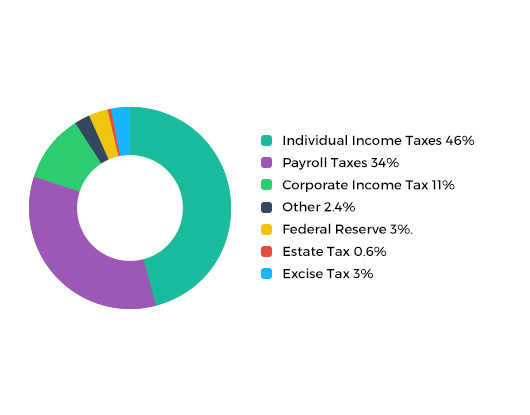 Federal estate taxes exempt a share of estates from federal estate taxes. For the 2017 tax year, if an estate’s worth less than $5.49 million, no federal estate taxes may apply. Wealth Advisory Group LLC is an Agency of The Guardian Life Insurance Company of America (Guardian), New York, NY. Securities products and services offered through Park Avenue Securities LLC (PAS), member FINRA, SIPC. OSJ: 355 Lexington Avenue, 9 Fl., New York, NY 10017, 212-541-8800. PAS is an indirect, wholly-owned subsidiary of Guardian. Wealth Advisory Group LLC is not an affiliate or subsidiary of PAS or Guardian. 355 Lexington Avenue, 9 Fl.